Rotator Cuff Strengthening is a common therapy approved of by doctors and enacted by physical therapists. 'Stretching and strengthening' is a common term. The idea is that rotator cuff tendonitis (or related pain and problem) is due to one or more muscles being 'weak', and that weakness is causing problems. Occasionally that's true and appropriate shoulder strengthening exercises can fix an ''imbalance'. But mostly, it's wasted time and effort. 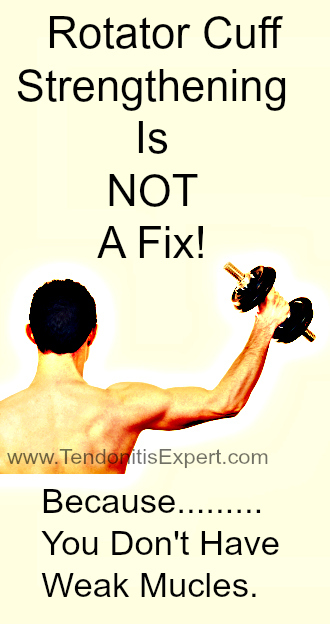 Rotator cuff tendonitis or injury isn't going to be fixed by stregthening exercises. See why farther down the page. If most shoulder pain resulted from muscle imbalance, then strengthening exercises would be great. Problem solved! But 'weak muscles' aren't the cause of Rotator Cuff Tendonitis, nor Rotator Cuff Injury. In those scenario's, are muscles performing as much work as they could be/should be? No. But is it because they are 'weak'? No. It is because they are suffereing from limited functionality, and thus can't work correctly. This leaves them in a weakened state, sure. It is NOT just semantics. 'Let's strengthen those weak muscles' implies that the muscles are healthy but need to work out some to get stronger. It would be accurate to call those muscles 'weak'. If you went to the gym you could, for the most part, make your muscles stronger. 'Can't work correctly' means exactly that. The muscle(s) are not working correctly, so they can not do their jobs correctly. Making a muscle that can't work correctly 'work harder' with rotator cuff strengthening exercises is kind of like taking a car with a flat tire to the race track and trying to go as fast as you can. Not a good idea. The car isn't going to go faster no matter how many times you force it around the track with the pedal to the metal. Not working correctly is the problem. So the very theory doctors and PT's apply to the majority of cases they see is incredibly flawed. Do you really have weak muscles? So, your muscles aren't actually weak. Your shoulder muscles aren't working correctly, and thus they can't perform work like they should. Many reasons. There's almost always more than a single factor in play. Those four factors are the Pain Causing Dynamic in a nutshell. That's what causes Tendonitis, no matter where it shows up. If you had and/or have a Rotator Cuff Injury, everything above applies. Before Rotator Cuff Surgery or after, the four factors above must be dealt with effectively, or things just aren't going to get better. Until you restore function of a muscle (or larger ecology), you're not going to regain much strength. 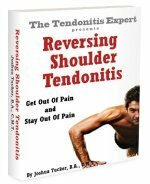 The quick answer is that you get the Reversing Shoulder Tendonitis program. It contains everything you need to know and do to decrease pain and cause functional rotator cuff strengthening. Relaxed muscle is good. Chronically tight muscle, not so good. Imagine a half squeezed sponge with plastic wrap shrunk wrapped down around it. Connective tissue is kind of like that plastic wrap. When a muscle is tight and then tightly wrapped in connective tissue, it gets stuck tight. It has no place to expand to when it relaxes, so it basically can't relax. Muscle can literally get stuck in a contracted state. The Process of Inflammation traps fluid in an area and releases chemical which enhances ones's sensitivity to pain. This extra pain tells the brain there is a problem, and the brain responds by tightening things up to guard and protect. The brain isn't very smart in some ways, so even if nothing is actually wrong, the brain can create problems as if there were. Stressors of any kind (physical, mental, emotional) eat up various nutrition. You MUST deal effectively with ALL four factors if you want results. Just dealing with one or two factors will help, and will help things feel better. But if you want to actually fix the problem, then you need to fix the CAUSES of the problem. Rotator cuff exercises like stretching or strengthening just aren't going to fix a shoulder problem. Return to the top of this Rotator Cuff Strengthening page.